Location: We will gather at Safe Berks, 255 Chestnut St., Reading. Safe Berks will honor and remember the Berks County victims of domestic violence on Tues. Oct. 23 at the 17th annual Silent Witness March & Dedication. According to our records, 59 Berks residents have been killed by domestic violence since 1999. 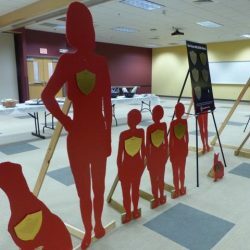 As we march from Safe Berks to Reading Area Community College, we will carry red, life-size silhouettes that symbolize the victims. Each silhouette wears a shield that describes the tragedy of their untimely death. Safe Berks provides free services to survivors of domestic violence and sexual assault. Last year, Safe Berks served more than 4,000 clients. Our Safe House provided a haven to approximately 800 people, including 400 children.